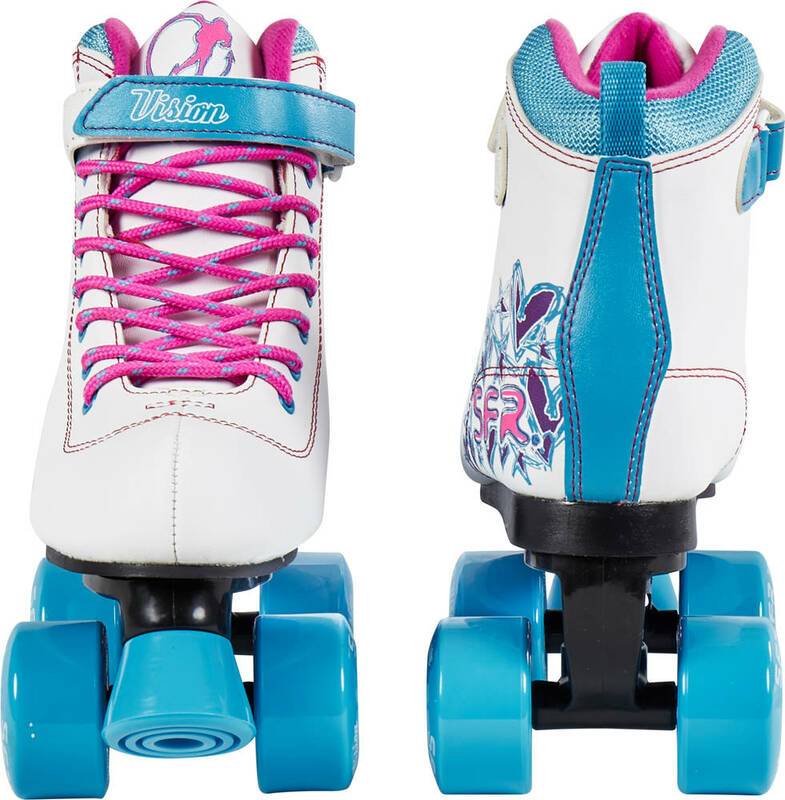 White roller skates for kids in a sporty design with nice blue and pink details that really freshen them up. The quads come with a big brake in front and they are designed to be durable. 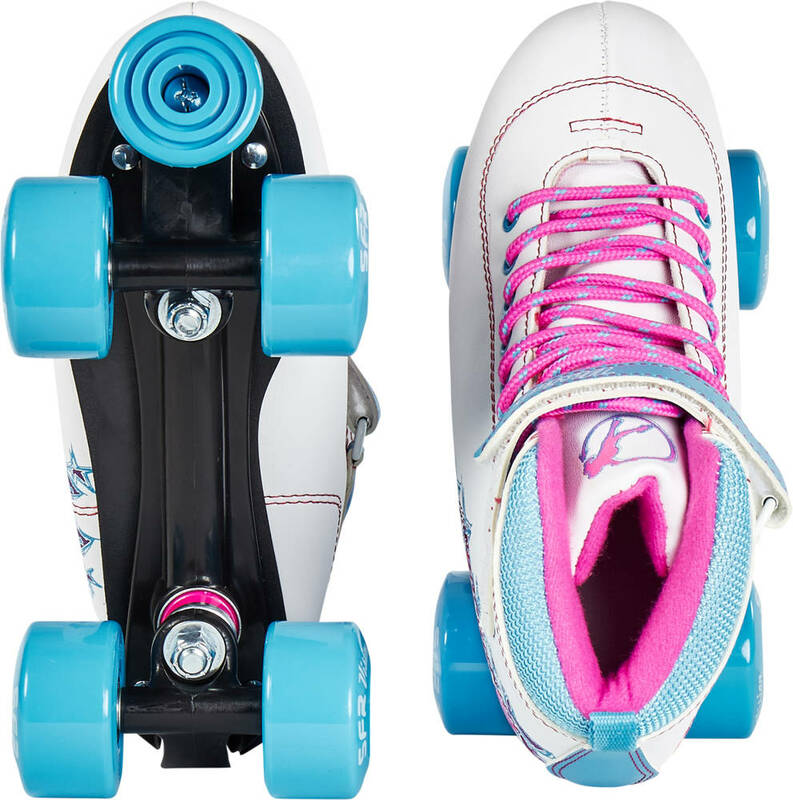 The SFR Vision kids roller skates are both great for indoor and outdoor skating. Made as semi-soft quad skates with laces and velcro straps to achieve the best fit possible. With the fresh and colourful look of these SFR roller skates, you can really join the "Soy Luna" skate wave, that has arisen with the "Soy Luna" TV-series on Disney - a series which has gained high popularity amongst the younger audience, encouraging an active lifestyle on skates. Really pleased with product. Granddaughter even more thrilled thank you. Arrived promptly, item was as requested. Can't review quality as it's a christmas present for our grand-daughter. Excellent product, my daughter was delighted with them. They do come up really small though, my daughter is a 1.5 narrow foot, I bought the 3 which fit perfectly. I would have preferred to exchange for the 4 but she really wanted to keep them and as I have a younger daughter, I decided to keep them. Very good quality. Very satisfied with product. Do come up rather narrow and on the smaller side, so do order up a size. Needed them in a rush for Christmas, phoned SkatePro and told them of the urgency, they said they'd be sure to get them out as a priority - within an hour I had an email said they'd been dispatched and received them 3 days later. Excellent service!! Thank you! Bought these skates for our niece. She hasnt taken them off since. Thank you skatepro for such brilliant service. Stylish & comfortable! Well liked by my kids. And speedy delivery was good too. By way of constructive feedback u might consider being more discreet with packaging as having skatepro celotape was a bit too obvious considering these were Xmas presents. The skates are perfect and great quality. My daughter absolutely loves them. The customer service was excellent and they were delivered earlier than expected. Thank you!! !